At some point – preferably before you get your horse, but at least soon after – you will have to decide what kind of bedding you want to use for your horse. Of course your horse’s comfort is an important consideration, but since, unlike your dog’s bed, this bedding won’t just be slept on – that’s right, horses are not “house broken” – there are other considerations too, such as absorbency and siftability (is that a real word, or did I just make one up?). When you greet your beautiful, elegant equine companion in the morning, you will see that he made a small project for you to work on that day. More likely, two or three projects. He probably even has some stuck to his face. Sweet. There are several options for horse bedding, beginning with the base – the stall floor. Our barn floor is just plain old dirt, but some barns have permanent flooring. You can also put in rubber floors – we are looking into that. They are easier to keep clean than dirt, and more comfortable for your horse than dirt or cement. On top of whatever kind of floor you have, you need the multi-purpose bedding. This should provide comfort for your horse and absorb whatever he may leave in there for you to muck out. 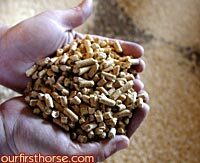 There are basically three choices: straw, wood shavings, and wood pellets. Straw is the classic barn bedding. Upsides: It’s cheap and easy. I think it’s pretty comfortable too – we used it at first, and Valentine never complained. Downsides: it’s not very absorbent, and it’s hard to sort the wheat from the chaff, so to speak…when you go for the poo, you get a lot of straw too. We haven’t used wood shavings for Valentine, but we do use them for our goat, Joey. They work great for Joey, because he hardly ever uses his little house as an outhouse, so one pack of shavings lasts forever. Upsides: They smell great, and cedar shavings, at least, naturally repel fleas. Downsides: We didn’t try these because we decided they wouldn’t be cost-effective. You’d have to buy a lot to fill a stall, and replace the soiled bedding with new shavings at a pretty good clip. …and presto! Soft, fluffy, absorbent and sweet-smelling bedding! Which equals a sweeter-smelling horse. If you love on your horse like I do, you’ll appreciate that. Equally importantly, the stall cleans up faster and easier than ever before. The sawdust – which is what you end up with after you wet the pellets down – sifts right through the fork and all you’re shoveling out is poo. The urine soaks into the sawdust until the sawdust has reached maximum absorbing capacity, then it clumps together and you can shovel it right out. My big sweetie always pees in exactly the same place, so I just shovel that spot out every couple of days and add more.